Power transmission couplings are widely used for modification of stiffness and damping in power transmission systems, both in torsion and in other directions (misalignment compensation). Technical literature on connecting couplings is scarce and is dominated by trade publications and commercial coupling catalogs. Many coupling designs use elastomers in complex loading modes; some couplings have joints with limited travel distances between the joint components accommodated by friction; often, couplings have severe limitations on size and rotational inertia, etc. These factors make a good coupling design a very difficult task, which can be helped by a clearer understanding of the coupling's functions. Stiffness values of couplings in both torsional and misalignment directions, as well as damping of couplings in the torsional direction, have a substantial, often determining, effect on the drive system dynamics. Torsionally flexible couplings are often used for tuning dynamic characteristics (natural frequencies and/or damping) of the drive/transmission by intentional change of their stiffness and damping. The purpose of this article is to distinctly formulate various couplings' roles in machine transmissions, as well as to formulate criteria for comparative assessment, optimization and selection of coupling designs. To achieve these goals, a classification of connecting couplings is given and comparative analyses of commercially available couplings are proposed. 1. Rigid Couplings. These couplings are used for rigid connection of precisely aligned shafts. Besides the torque, they also transmit bending moments and shear forces if any misalignment is present, as well as axial force. The bending moments and shear forces may cause substantial extra loading of the shaft bearings. Principal application areas of rigid couplings are: long shafting; space constraints preventing use of misalignment-compensating or torsionally flexible couplings; and inadequate durability and/or reliability of other types of couplings. 2. Misalignment-Compensating Couplings. These are required for connecting two members of a power transmission or motion transmission system that are not perfectly aligned. "Misalignment" means that components-coaxial by design-are not actually coaxial, due either to assembly errors or to deformations of subunits and/or foundations. The latter factor can be of substantial importance for large turbine installations (therma/creep deformations leading to drastic load redistribution between the bearings) and for power transmission systems on non-rigid foundations (such as ship propulsion systems). 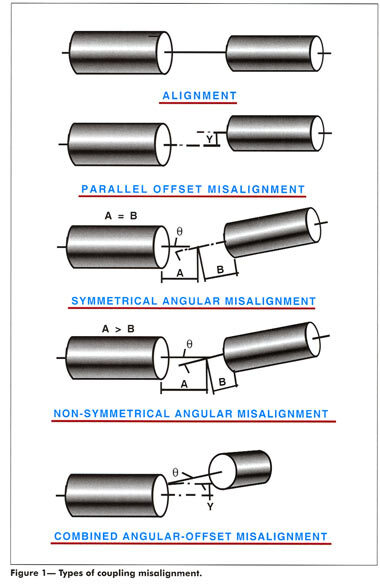 Various types of misalignment as they are defined in AGMA standard 510.02 are shown in Figure 1. (Editors note: AGMA 510.02 hasbeen superseded hyANSIIAGMA 9009 - D02 - Nomenclature for Flexible Couplings, and the newer standard uses slightly different terminology. The older version is used here for illustrative purposes.) If the misaligned shafts are rigidly connected, this leads to their elastic deformations, and thus to dynamic loads on bearings, to vibrations, to increased friction losses, and to unwanted friction forces in servo-controlled systems. Purely misalignment-compensating couplings have torsional deformations and misalignment-compensating deformations decoupled from movements associated with misalignments. 3. Torsionally Flexible Couplings. Such couplings are used to change dynamic characteristics (natural frequency, damping and character/degree of nonlinearity) of a transmission system. The changes are desirable or necessary when severe torsional vibrations are likely to develop in the transmission system, leading to dynamic overloads. Designs of torsionally flexible couplings usually arenot conducive to compensating misalignments. 4. Comhination Purpose Couplings. These combine significant compensating ability with significant torsional flexibility. The majority of the commercially available connecting couplings belong to this group. Since the torsional deformations and deformations due to misalignments are not separated/ decoupled by design , changes in torsional stiffness may result in changes in misalignment-compensating stiffness, and vice versa. These couplings will be discussed in detail in Part II of this article, which will appear next issue. Typical designs of rigid couplings are shown in Figure 2. Sleeve coup lings as in Figures 2a and 2b are the simplest and the slimmest ones. Such a coupling transmits torque by pins (Fig. 2a) or by keys (Fig. 2b). The couplings are difficult to assemble/disassemble, as they require significant axial shifting of the shafts to be connected/disconnected. Usually, external diameter D = (1.5-1.8) d, and length L = (2.5-4.0) d.
Flange couplings (Fig. 2c) are the most widely used rigid couplings. Two flanges have machin ed (reamed) holes for precisely machined bolts inserted into the holes without clearance (no backlash). The torque is transmitted by friction between the contact surfaces of the flanges and by shear resistance of the bolts. Usually, D = (3- 5.5) d, and L = (2.5-4.0) d.
A split-sleeve coupling (Fig. 2d) transmits torque by friction between the half-sleeves and the shafts and, in some cases, also by a key. Their main advantage is ease of assembly/disassembly. 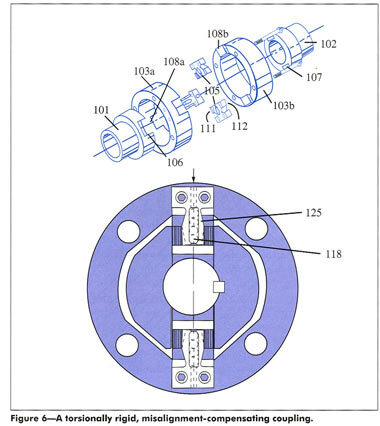 Misalignment -compensating couplings are used to radically reduce the effects of imperfect alignment by allowing a non-restricted or a partially restricted motion between the connected shaft ends in the radial and/or angular directions. Similar coupling designs are sometimes used to change bending natural frequencies/modes of long shafts. When only misalignment compensation is required, high torsional rigidity and, especially, absence of backlash in the tor sional direction, are usually positive factors, preventing distortion of dynamic characteristics of th e transmission system. The torsional rigidity and absence of backlash are especially important in servo-controlled systems. To achieve high torsional rigidity together with high compliance in misalignment directions (radial or parallel offset, axial, angular), torsional and misalignment-compensating displacements in the coupling have to be separated by using an intermediate compensating member. Typical torsionally rigid, misalignment-compensating couplings are Oldham couplings, which compensate for radial misalignments (Fig. 3a); gear couplings, which compensate for small angular misalignments (Fig. 3b); and universal or Cardan joints, which compensate for large angular misalignments (Fig. 3c). Frequen tly, torsionally rigid "misalignment-compensating" couplings, such as gear couplings, are referred to in the trad e literature as "flexible" couplings. Usually, transmissions designed for greater payloads can tolerate higher misalignment-induced loads. Accordingly, the ratio between the load generated in th e basic misalignment direction (radial or angular) to the payload (rated torque or tangential force) is a natural design criterion for purely misalignment-compensating (torsionally tigid) couplings. • Subclass A—couplings in which the displacements between the hubs and compensating member have a frictional character (examples include conventional Oldham couplings, gear couplings and Cardan joints). • Subclass Be—couplings in which the displacements are due to elastic deformations in special elastic connectors. The force Fcom does not depend on the misalignment magnitude. This is a negative feature, since a relatively small real-life misalignment may generate high forces acting on bearings of the connected shafts. Since motions between the hubs and the compensating member are of a "stick-slip" character, with very short displacements alternating with stoppages and reversals, µ might be assumed to be the static friction ("stiction") coefficient. A lower friction and/or larger effective radius would lead to lower forces on the bearings. Unlike the Subclass A couplings, Subclass B couplings develop the same radial force for a given misalignment, regardless of the transmitted torque; thus they are more effective for large Tr , Of course, a lower stiffness of the elastic connectors would lead to lower radial forces. Conventional Oldham couplings, gear couplings and u-joints (Subclass A). Misalignment-compensating couplings are used in cases where a significant torsional compliance can be an undesirable factorand/or a precise alignment of the connected shafts cannot be achieved. Universal joints (u-joinrs or Cardan joints) are used in cases where the' dominant type of shaft misalignment is angular misalignment. Use of a single joint results in a non-uniform rotation of the driven shaft, which can be avoided by using double joints or specially designed "constant velocity" joints. Compensation of a radial misalignm ent requires using two Cardan joints and relatively long intermediate shafts. If bearings of the u-joint are not preloaded, the joint has an undesirable backlash, but preloading of the bearings increases frictional losses and reduces efficiency. More sophisticated linkage couplings are not frequendy used, due to the specific characteristicsof general-purpose machinery, such as limited space, limited amount of misalignment to compensate for, and cost considerations. While u-joints use sliding or rolling (needle) bearings, both Oldham and gear couplings compensate for misalignment of connected shafts by means of limited sliding between the hub surfaces and their counterpart surfaces on the intermediate member. The sliding has a cyclical character, with double amplirude of displacement equal to radial misalignment e for an Oldham coupling and Dpθ for a gear coupling (Ref 5), where Dp is the pitch diameter of the gears and θ is the angular misalignment. If a radial misalignment e has to be compensated by gear couplings, then two gear couplings spaced by distance L are required, and θ = e/L. Such a motion pattern is not conducive to good lubrication, since at the ends of the relative travel, where the sliding velocity is zero, a metal-to-m etal contact is very probable. The stoppages are associated with increasing friction coefficients, close to the static friction values. This is the case for low-speed gear couplings and for Oldham couplings; for high-speed gear couplings, the high lubricant pressure due to centrifugal forces alleviates the problem (Ref 5). Figure 3a shows a compensating (Oldham) coupling, which-at least theoretically-allows the connection of shafts with a parallel misalignment between their axes without inducing nonuniformity of rotation of the driven shaft and withou t exerting high loads on the shaft bearings. The coupling comprises two hubs, (1) and (2), connected to the respective shafts and an intermediate disc (3). The torque is transmitted between driving member (1) and intermediate member (3), and between intermediate member (3) and driven member (2), by means of two orthogonal sliding connections, a-b and c-d. By decomposition of the misalignment vector into two orthogonal components, this coupling theoretically assures ideal radial compensation while being torsionally rigid. The latter feature may also lead to high torque-to-weight ratios. However, this ingenious design finds only an infrequent use, usually for noncritical, low-speed applications. Some reasons for this are as follows. Its direction changes abru ptly four times per revolution. Similar effects occur in gear couplings. An experimental Oldham coupling (Tr = 150 N-m, external diameter Dex = 0.12 m, e = 1 mm and n = 1,450 rpm) exerted radial force on the connected shafts Fcom = 720 N.
The frequent stoppages and direction reversals of the forces lead to the high noise levels generated by Oldham and gear couplings. A gear coupling can be the noisiest component of a large power-generation system (Ref 6). A sound pressure level Leq = 96 dBA was measured at the experimental Oldham coupling described above. Since a clearance is needed for normal functioning of the slid ing connections) the contact stresses are nonuniform with high peak values (Fig. 4). 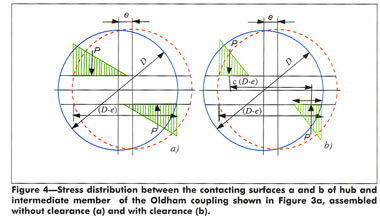 Figure 4a shows stress distribution between the contacting surfaces a and b of hub (1) and intermediate member (3) of the Oldham coupling shown in Figure 3a assembled without clearance. The contact pressure in each contact area is distributed in a triangular mode along the lengrh 0.5(D - e) ≈ 0.5D. However, the clearance is necessary during assembly, and it increases due to inevitable wear of the contact surfaces. Presence of the clearance changes the contact area as shown in Figure 4b, so that the contact length is 1 ≈ 0.3(D - e) ≈ 0.3D (or the contact length is 0.5c(D - e), c ≈ 0.68), thus significantly increasing the peak co ntact pressures and further increasing the wear rate. This leads to a rapid increase of the backlash, unless the initial (design) contact pressures are greatly reduced. Such non-uniform contact loading also results in very poor lubrication conditions in the stick-slip motion. As a result, friction coefficients in gear and Oldham couplings are quite high, especially in the latter. Experimental data for gear couplings show µ = 0.3-0.4. Similar friction coefficients are typical for Oldham couplings. The coupling components must be made from a wear-resistant material (usually heat-treated steel) since the same material is used both for the hub and the intermediate disc structures and for the sliding connecrions. Friction can be reduced by making the intermediate member from a low-friction plastic, such as ultra-high molecular weight (UHMW) polyethylene, but this may result in a reduced rating due to lowered structural strength. Because of high misalignment compensating forces, deformations of the coupling assembly itself can be very substantial. If the deformations become equal to the shafts' misalignment, the no sliding will occur and the coupling behaves as a solid structure, being cemented by static friction forces. It can happen at misalignments below e ≈ 10-3Dex. This effect seems to be one of the reasons for the trend toward replacing misalignment-compensating couplings by rigid couplings, such as the rigid flange coupling in Figure 1c, often used in power generating systems. For µ = 04 and e = 0.01Dex , η = 0.987 and for µ = 0.3 , η = 0.99. Similar (slightly better due to better lubrication) efficiency is characteristic for singlegear couplings. This inevitable backlash in the gear and Oldham connecrions is highly undesirable for servo-controlled transmissions. Oldham couplings and u-joints with elasticconnections (Subclass B). The basic disadvantages of conventional Oldham and gear couplings (high radial forces, jumps in the radial force direction) energy losses) backlash, nonperformance at small misalignments, noise) are all associated with reciprocal, short travel, poorly lubricated sliding motion between the connected components. There are several known techniques of changing friction conditions. Rolling friction bearings in u-joints greatly reduce fricrion forces. However, they do not perform well for small-amplitude reciproca lmotions. In many applications, shafts connected by u-joints are installed with an artificial 2-3° initial misalignment to prevent jamming of the rolling bodies. Another possible option is using hydrostatic lubrication. This technique is widely used for rectilinear guide ways, journal and thrust bearings, screw and worm mechanisms, etc. However, this technique seems impractical for rotating systems with high loading intensity (and thu s high required oil pressures). Replacement of sliding and rolling friction by elastically deformable connections can resolve the above problems. Figure 5 shows a "K" or "Kudnaverz" coupling made from a strong, flexible material (polyurethane) connected with the hubs by two "tongues" each. If the connected shafts have a radial offset, it is compensated by bending of the tongues, thus behaving like an Oldham coupling with elastic connections between the intermediate member and the hubs. If the connected shafts each have an angular misalignment, the middle membrane behaves as a "cross," while twisting deformations of the tongues create kinematics of a u-joint. As a result, this coupling can compensate large radial misalignments (~2.4 mm for a coupling with external diameter of D = 55 mm), as well as angular misalignment s of , ±10 degrees. The torque ratings of such couplings are obviously quite low; e.g., a coupling with outside diameter D = 55 mm has a rated torque Tr = 4.5 N-m. Since displacements in the sliding connections a-b and c-d in Figure 3a are small (equal to the magnitude of the shaft misalignment), the Oldham coupling is a good candidate for application of the thin-layered rubber metal laminates (Ref. 1). Some of the advantages of using laminates are their very high compressive strength, up to 100,000 psi (700 MPa), and insensitivity of their shear stiffness to the compressive force. This property allows the preloading of the flexible element without increasing deformation losses. Figure 6 (from Ref 2) shows such an application. Hubs 101 and 102 have slots 106 and 107, respectively, whose axes are orthogonal. The intermediate disc can be assembled from two identical halves 103a and 103b. Slots 108a and 108b in the respective halves are also orthogonally oriented. Holders 105 are fastened to slots 108 in the intermediate disc and are connected to slots 106 and 107 via thin-layered rubber-metal laminated elements 111 and 112 as detailed in Figure 6b. These elements are preloaded by sides 125 of holders 105, which spread out by moving preloading roller 118 radially toward the center. This design provides for all kinematic advantages of the Oldham coupling without creating the above-listed problems associated with conventional Oldham couplings. The backlash is totally eliminated since the coupling is pre1oaded. For the same rated torque, the coupling is much smaller than the conventional one due to the high load carrying capacity of the laminates and the absence of stress concentrations like ones shown in Figure 4b. The intermediate disc (the heaviest part of the coupling) can be made from a light, strong material, such as aluminum, since it is not exposed to contact loading. This makes the coupling suitable for high speed applications. where β is the loss factor of th e rubber. For the experimentally tested coupling (Dex = 0.12 m), the parameters are: a laminate with rubber layers 2 mm in thickness; ψ = 0.2; ksh = 1.8 x 105 N/m; T= 150 N-m; e = 0.001 m; thus η = 1 - (0.2 x 1.8 x 105 x 10-6)/150π = 1 - 0.75 x 10-4 = 0.999925, or the losses at full torque are reduced 200 times as compared to the conventional coupling. Test results for the conventional and modified Oldham couplings having Dex = 0.12 m have shown th at the maximum transmited torque was the same, but there was a 3.5 times reduction in the radial force transmitted to the shaft bearings with a modified coupling. Actually, the coupling showed the lowest radial force for a given misalignment compared with any commercially available compensating coupling, including couplings with rubber elements. In addition to this, the noise level at the coupling was reduced by 13 dBA to Leq = 83 dBA. Using ultra thin-layered laminates for the same coupling would further increase its rating by at least one order of magnirude, and may even require a redesign of the shafts to accommodate such a high transmitted load in a very small coupling. U-joints transmit rotation between two shafts whose axes are intersecting but not coaxial (Fig. 3c). A u-joint also has an intermediate member ("spider" or "cross") with four protruding pins ("trunnions") whose intersecting axes are located in one plane at 90° to each other. As in th e O ldham coupling, two trunnionshaving the same axis aremovably engaged with journals machined in the hub ("yoke") mounted on one shaft, and the other two trunnions, with the yoke attached to the other connected shaft. However, while the motions between the intermediate member and the hubs in the Oldham coupling are translational, in the u-joint these motions are revolute. This design is conducive to using rolling friction bearings, but the small reciprocating travel regime under heavy loads requires derating of the bearings. A typical embodiment of th e u-joint with thin-layered rubber-metal bearings (Ref. 3) is illustrated in Figure 7 for a large-size joint. Figure 7 shows two basic units (out of four constituting the universal joint): yoke-trunnion-elastomeric bearing sleeve (parts 31,33 and 35 respectively) and yoke-trunnion-elastomeric bearing sleeve (parts 32, 34 and 35, respectively). Sleeves (35) comprise rubber-metal laminates (37) having sleeve-like rubber layers (38). Separating them and bonded to them are sleeve-like thin, reinforcing, intermediate metal layers (39) and inner (40) and outer (41) sleeve-like material layers bonded to the extreme inner and outer sleeve-like rubber layers. The inner and outer metal layers of the laminated bearing sleeve aremade thicker than the intermediate metal layers, since they determine the overall shape of elastomeric bearing sleeves. The inner surface of the inner layer (40) is made tapered and conforming with the tapered outer surfaces of trunnions 33 and 34. The outer surface of the outer layer (41) is made cylindrical and conforming with the internal cylindrical surface of th e bore in yoke 31. Each bearing sleeve (35) is kept in place by a cover (44) abutting the end surface (43) of the outer metal layer (41). The cover is fastened to the outer metal layer and to the yoke by bolts. A threaded hole is provided in the center of the cover. Before assembly, the wall thickness of the elastomeric bearing sleeve (a sum of total thickness of rubber layers, intermediate merallayers and inner and outer metal layers) is larger than th e annular space between the inside surface of the bore in the yoke (31) and the respective outside surface of the trunnion (33). The difference between the wall thickness of th e bearing sleeve and th e available annular space is equal to the specified preloading compression deformation of the elastomeric bearing sleeve. To perform assembly operation, the tapered bearing sleeve is inserted into the wider opening of the tapered annular space between the internal surface of the bore and the external surface of the trunnion and pressed into this space by a punch shaped to contact simultaneously both end surfaces. Wedge action of the tapered connection between the conforming inner surface of metal layer 40 and outer surface of trunnion33 results in expansion of metal layer 40, in compression (preloading) of rubber layers and in gradual full insertion of the bearing sleeve into the annular space between the yoke and trunnion. The simultaneous contact between the pressing punch and both end surfaces of inner metal layer 40 and outer metal layer 41 assures insertion of the bearing sleeve without inducing axial shear deformation inside the bearing sleeve, which can cause distortion or even damage of the bearing sleeve. To disassemble the connection, bolts attaching the cover to the yoke are removed, and then a bolt is threaded into a hold until contacting the end surface of the trunnion. The further threading of the bolt pushes the outside cover together with the outer metal layer of the bearing sleeve, to which the cover is attached by bolts. 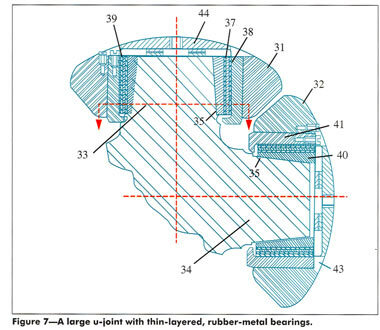 The initial movement causes shear deformation in the rubber layers until disassembly protrusions engage with the inner metal layer, thus resulting in a uniform extraction of the bearing sleeve. It is highly beneficial that u-joints with the rubber-metal laminated bearings do not need sealing devices and are not sensitive to environmental contamination (dirt, erc.). where ktor is the torsional stiffness of the connection between the intermediate member and one yoke. It can be compared with efficiency of a conventional u-joint where d is the effective diameter of the trunnion bearing, 2R is the distance between centers of the opposite trunnion bearings, and µ is the friction coefficient in the bearings. A comparison of Equations 7 and 14 with Equations 12 and 13, respectively, shows that while efficiencies of conventional Oldham couplings and u-joints for a given e, α are constant, efficiency of the modified designs using rubber-metal laminated connections increases with increasing load (when the energy losses are of the greatest importance). The losses in an elastic Oldham coupling and u-joint at the rated torque can be 1-2 decimal orders of magnitude lower than the losses for conventional units. Due to high allowable compression loads on the laminate (in this case, high radial loads), the elastic Oldham couplings and u-joints can be made smaller than the conventional units with sliding or rolling friction bearings for a given rated torque. The laminates are preloaded to eliminate backlash, to enhance uniformity of stress distribution along the load-transmitting areas of the connections, and to increase torsional stiffness. Since there is no acrual sliding between the contacting surfaces, the expensive surface preparation necessary in conventional Oldham couplings and u-joinrs (heat treatment, high-finish machining, erc.) is not required. The modified Oldham coupling in Figure 6 and the u-joint in Figure 7 can transmit very high rorques while effectively compensating large radial and angular misalignments, respectively, and having no backlash since their laminated flexible elements arepreloaded. However, for small-rated torques, there are very effective and inexpensive alternatives to these designs whose kinematics are similar. These alternatives are also backlash-free. One is a Kudriavetz coupling, shown in Figure 5. Another alternative is a modified spider or jaw coupling whose cross section by the mid-plane of the six-legged spider is shown in Figure 8 (Ref 4). 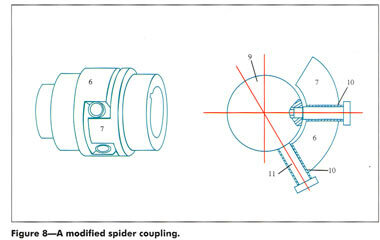 In this design the elastomeric spider of the conventional jaw coupling shown in Figure 10a is replaced with a rigid spider (9, 11) carrying tubular sleeves or coil springs (10) supported by spider pins (11) and serving as flexible elements radially compressed between cams (6 and 7) protruding from the respective hubs. If the number of spider legs is four, at 900 to each other, then the hubs have relative angular mobiliry, and the coupling becomes a u-joint with angular mobiliry greater than 10°, but with much higher rated torque than an equivalent size Kudnavetz coupling. Purely misalignmenr compensating couplings described in this section have their torsional and compensating properties decoupled by introduction of the intermediate member. Popular bellows couplings have high torsional stiffness and much lower compensating stiffness, but their torsional and compensating properties are not decoupled, so they are representatives of the "combination purpose couplings" group, which will be discussed in detail in Part II of this article, which will appear next issue. 1. Rivin, E.I. Stiffness and Damping in Mechanical Design, 1999, Marcel Dekker, Inc., NY. 2. "Torsionally Rigid Misalignment Compensating Coupling," U.S. Patent 5,595,540. 3. "Universal Cardan Joint with Elastomeric Bearings,"U.S. Patent 6,926,611. 4. "Spider Coupling," lJ.S. Patent 6,733,393. 5. "Torsional Connection with ,Radially Spaced Multiple :Flexible Elements," U.S. Patent 5,630,758. 6. Rivin, E.I. 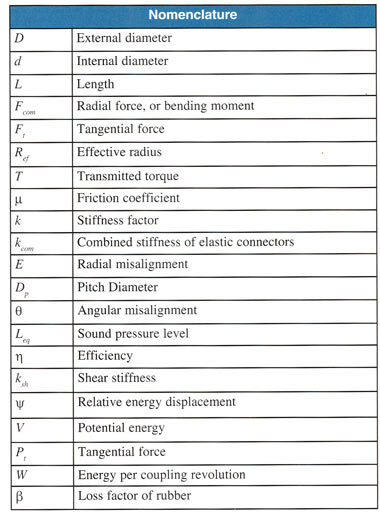 "Shaped Elastomeric Components for Vibration Control Devices," Sound and Vibration, 1999, Vol. 33, No. 7, pp. 18-23. This article has been reproduced with the permission of Power Transmission Engineering.